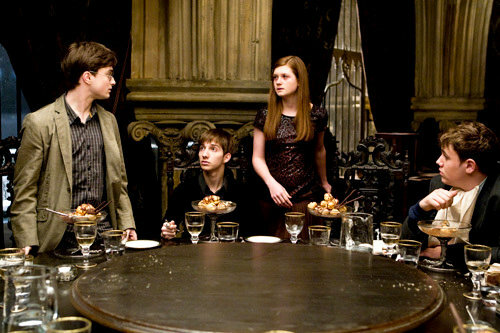 I watched HARRY POTTER AND THE HALF-BLOOD PRINCE (2009) on 3.10.12. It was my second viewing, and second ranking, of the film. Rereading the original review, I’m glad I’m taking another look at this. Not that anything is wrong with that first look, but much of it feels like I was waiting around for the last two movies to be made. In some ways, this is a bridge film. A great detour is taken to allows some of these characters’ relationships to play out. The last film had no time for Quidditch, but we get back into it. The series is better off for it, even if this movie advances the plot only marginally compared to the other films. I described this as “one of the best films about adolescent love of the decade”. While I am no expert on that particular genre, I can’t say that there are too many movies I can think of which challenge it. Most films on the subject are either very small independent films, or they are broad comedies. The Harry Potter series is so long that they can take their time, over roughly 24 hours of a filmed series, to take some time with how young adults relate to each other in an intimate and physical sense. I found myself enjoying this section of the film greatly, if only because I know these characters so damn well at this point. The filming of this movie utilizes much more long shot than I had remembered. While this often leaves us some breathtaking views, much of it is also done utilizing a bunch of CGI. This isn’t a problem when it melds in with the rest of the world, but sometimes the tracking or zoom (or, really, just any long moving shot) has its share of artificiality. However, the entirety of Hogwarts is given such a loving touch that the film manages to balance out those imperfections. Now that I know how the series turns out, I have to say that Alan Rickman’s performance of Snape is stellar. I’m not using hyperbole there either. He is just so subtle, and works as a sort of Rorschach Test as you see in his face what you want to see. My feeling about him was entirely different watching it this time than it was last time. Great work. In general, this is the film where these lead kids take a giant leap forward in acting. Partly, because they spend less time being scared, and more time being kids their own age. But also, part of it has to do with the feel of the series as seen by David Yates as well as the fact that these actors are wearing Harry, Hermione, and Ron as they would a comfortable pair of sweatpants. They just smoothly inhabit these characters at this point. The climax of this film is powerful, and offsets the lightness that most of the HALF-BLOOD PRINCE spends time building. It’s as if they know that there is no going back once the scene in the tower is done, so they better get their fun in while they can. In many ways, this is the least serious film since the first until the cave scene comes along. It is also the first film where the ‘villain’ is someone we know, rather than some new introduction. My one large issue with this film is that I feel like this is the first time I am missing a bunch of stuff from the book. The other films do a nice job of telling a complete story, even if loyal readers feel cheated by certain sections being omitted. But with Dumbledore missing for much of the time, and the ultimate explanation given being weak and brief, I really felt the hole there. The idea that Dumbledore was out looking, while not knowing that a Horcrux was involved, probably felt much less clunky in the novel. It truly the first time in the series I felt that way. In the end, I have a great appreciation for where this film fits into the entire narrative, even if it doesn’t blow me away like THE ORDER OF THE PHOENIX did. I’m glad I got to this again now that I have seen them all. Previous ranking: 6; 8; 7; 6 (final score: 6.75)… so I feel the same about the Film and Writing aspects, and have a slightly greater love for the Movie and Acting. Makes sense. ~ by johnlink00 on March 11, 2012.